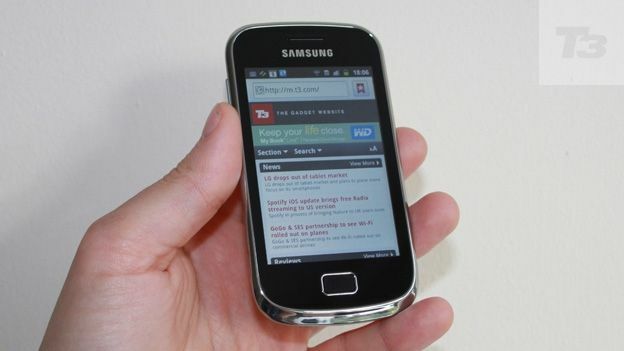 Is the Samsung Galaxy Mini 2 an overly basic Android or pocket sized hero? The Samsung Galaxy Mini 2 is a pocket sized fun machine from Samsung. Can it compete with the Sony Xperia U and HTC One V? There's a huge amount of Galaxy smartphones firing out of the Samsung factory. Many are produced for different countries, many are produced to target rival smartphones and some are just turned into reality as an experiment, or so it seems. The mid-range Samsung Galaxy Mini 2 has one eye on the rugged pebble smartphone known as the Motorola Defy Mini and the other eye on the new range of high-spec yet pint sized smartphones such as the Sony Xperia U and HTC One V. From the start, it's clear that this is a first time Android designed for chat, music and chaotic nights out. Despite its yellow backside looking like the frame of a Sony Walkman from the eighties, this is one of the most solid Samsung smartphones in existence. The ridged back of the smartphone isn't going to pick up scratches easily and the face is similar solid in the face of adversity. The MicroSD card slot is neat with a secure flap and the two inputs - headphone socket and Mirco USB - are well placed at the top and bottom of the body respectively. There's a similar minimalist feel to the buttons to - power, volume rocker and home button are physical keys while the Menu and Back buttons are touchscreen, sitting on either side of the home button. There's 4GB of memory on board which is more than we expected for a smartphone in this style and there's the option to add a MicroSD card too. The 3 megapixel camera (no flash or Auto Focus) and low resolution screen (320 x 480 pixels) are both disappointing for the price tag and they're minor upgrades to the original Samsung Galaxy Mini and way behind the £99 Huwaei Ascend G300. The general feature set, including Android 2.3, is firmly in the budget range for smartphones, despite the mid-range price. The Samsung Social Hub works well and there's useful pre-installed apps but the rugged body is the only key feature that makes it stand out from the pack, alongside the loud yellow casing. The 320 x 480-pixel resolution is at the lower end of what we expect in 2012 for a 3.2-inch screen. It's not great in daylight and not particularly good when it comes to viewing at an angle, rather than in front of you face. Web browsing is a muddy experience with text heavy sites, meaning you'll need apps for news as Google pages look blurred and the small, reflective screen doesn't help viewing when on-the-go. The display is very responsive but it can't rival the glamour Bravia Engine powered Sony Xperia U display or the recent, bigger Alcatel One Touch Ultra 995. Video and photos lack colour and overall detail leading to poor experience overall. An 800Mhz processor is powerful enough to run the apps and games you'll be using on the Samsung Galaxy Mini 2 but multi-tasking and flicking through menus can quickly become sluggish. Combined with the low-end 3 megapixel camera, it's not a great proposition if you're going beyond calls, texts and Facebook. Spotify struggled at times when running other stuff in the background, so the dedicated music player is a better option. The display response is quick off the mark but we can't help feeling that corners have been cut. If Huwaei can offer a 1 Ghz processor for a much lower price, couldn't Samsung bump up the power a bit more and create a smoother experience? The 1300 mAh removable battery lasted just over a day but because of the small screen and general processor demands, younger users will demand closer to two from this style of phone. The social apps and palm sized portability are quoted as key benefits to the Samsung Galaxy Mini 2 but both are overshadowed by a battery life in line with larger, smartphone giants with a 4 inch display. It's a struggle to see why the fun sized smartphone market exists when larger smartphones with better cameras, processors and add-on freebies like HTC's 25GB DropBox subscription sit in the same (or much lower) price bracket. It's the price tag that hits the Samsung Galaxy Mini 2 hard. It's simply not a good enough phone to justify a price tag beyond £99 and even that's pushing it against rivals. A confused, lacking effort from Samsung. It's time to ditch the disc, grandad!